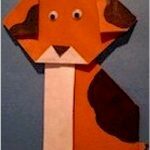 You can make any kind of animal out of cardboard tubes… we made a cute Cardboard Tube Puppy Puppet. Make all different kinds using our craft projects or create your own. Glue a jumbo craft stick inside the empty tube for a handle. Cut out ears and paint. Glue in place. Draw on details with marker.